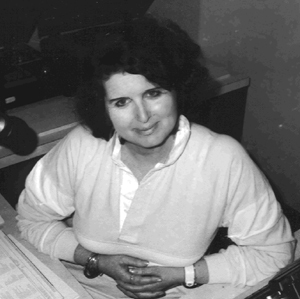 Delphine Marcus was a WMNR broadcaster from 1982 until her death in 2005. Here is a remembrance from her fellow broadcaster Joanne Moryl and an article written by Delphine about her musical favorites. At first I didn't think she'd come, because she always had so many places to go; you couldn't even pin her down for lunch! But I had told her all about my little seaside cottage in Nova Scotia; about the beach, and the cliffs, and the spectacular sunsets, and her face lit up with delight when I asked her to come up and spend some time with me. So, we made plans. I had been there a few weeks and I looked forward to the companionship and conversation of someone besides my dog Reggie. Most of all, though, I was anxious to share something I love with a beloved friend. We agreed to meet at the Tourist Centre on Lockeport Beach. She hopped out of the car wearing a bright red jacket, a huge grin on her face; and her salt and pepper hair was about two inches long. I remember thinking I had never seen her look so beautiful. I could hardly wait for her reaction to that pristine, mile-long crescent of sand-and then, when she saw the ocean stretching out behind the cottage, I wasn't disappointed. I could tell she was thrilled. From the first moment they met, she and my pushy, extroverted young dog Beardie adored each other, and whenever she sat in what became her favorite easy chair he would crawl into her lap, all 45 pounds of him! When she wasn't in the chair, he followed her everywhere; when she was out of sight, he would sit by the door and wait for her. That ingrate of a dog had truly forgotten me, the hand that feeds him! But it was obvious that these two had formed a special bond, and watching them hang out together was a beautiful thing to see. What followed were four wonderful days of sharing very personal and precious things. She was the best listener I had ever known, and her own life experiences had made her wise, and understanding, and funny, and dear. We cooked together like two gourmets in my pretty little country kitchen-she did pork chops; I did scallops; and in between we feasted on exotic English cheeses, South American wine, and thick, crusty Canadian bread. But most of all, we talked! We watched some of our favorite old films on my 13-inch TV with my rickety old VCR; we drank wine, and talked some more-she in that easy chair with Reggie and I on my lumpy but comfortable couch-and always in the presence of panoramic sky, astounding sunsets, and wave-swept beach. Some days we left the cottage and walked the beach, or drove to a little restaurant I know where you can eat lunch on an open deck that extends out over a rocky shore. We drove to Lunenburg, an old town with gorgeous Victorian houses built into a hillside overlooking a wide harbor. We spent quiet time in small art galleries and crafty little shops filled with the works of local artists. These were indeed a few perfect days where we could be quiet together-or not-and mostly we were not. We talked constantly, and always late into the night. By the time we had to say goodbye we were both hoarse! She left at 4:30 a.m. on a Friday, in deep darkness and a thick pea-souper, but as she drove away into that fog I could hear the car radio blasting some kind of wonderful Latin jazz. That was Delphine. She's gone now, but the times we had together are with me, as vivid and alive as she was. My first REAL musical memory was when I was about five years old - it was Christmas Day in England - a grey sullen winter's day with a weak sun struggling unsuccessfully to shine - I was gazing out of the window at the leafless trees and listening to my Grandfather's recording of Beethoven's 7" Symphony (we always listened to music following dinner) - Wagner called this symphony the 'Apotheosis of the dance' I loved its joyfulness as a child & would dance to it. Sometimes my Grandmother would sing as my Grandfather accompanied her at the piano. She had an eclectic repertoire, singing operetta as well as some of the songs from the London stage - I loved it & would sit rapturously listening. Several years later in Germany - a rainy Summer's afternoon, the lawns lush & green and the sound of the Brahms 4"' symphony from our radiogram and then later that evening attending a concert in Aachen & seeing the great pianist Wilhelm Kempf perform the Beethoven 4"' Piano Concerto - what a super day of memorable music that was! Of course, attending the Promenade Concerts at The Royal Albert Hall in London was a must, especially the last night - the feeling of pride when the conductor turned on the podium and conducted the audience singing Elgar's Land of Hope & Glory (the Pomp & Circumstance March #1) and the tremendous applause - some of it raucous from us students - which followed plus the encore rendition! Often my thoughts turn to Baalbek in The Lebanon, I remember sitting in that ancient place by moonlight and listening to Bach - anything by Bach goes with moonlight! Also the memory of driving across part of that great desert the Dashti Lut in Iran & tuning in to Mahler's "Das Lied von der Erde"on the BBC overseas broadcast with an old short wave radio, and how the music fitted in with the beauty of that rugged landscape. It was my Grandmother who introduced me to the movies. She was an ardent fan and would take me with her on different occasions. Her favorites were Bette Davis, Vivien Leigh, Clark Gable et al. I remember seeing Jeannette Macdonald & Nelson Eddy in "Maytime" with her & loving the music. My Grandfather always said that if the film made my grandmother cry - then he was certain she had enjoyed it! It was my Mother who took me to see "Dangerous Moonlight" and I remember that day in London every nine I hear Richard Addinsell's Warsaw Concerto (which was part of the score for the film), because when we came out of the cinema the air raid siren wailed its warning and we had to seek shelter from the bombs. My children have their favorite pieces of music which they danced & listened to when they were young - Aaron Copland's Rodeo Ballet, Jacques lbert's Divertissinent & my five year old granddaughter, Bridget, adores Mozart's Magic Flute for Kids (although she says that the Queen of the Night is a little bit scary)! I have the great luxury of being able to share my musical loves with you, the listener here at WMNR. What pleasure it brings me when you can to tell me how much you enjoyed a certain piece of music you have just heard. I think we all can contribute some event when music has played an important role in our lives. What would life be without music and, of course, WMNR!